FREE SHEET MUSIC! Click the image to download. 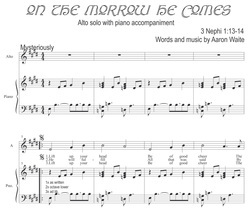 Click the image above to view and print this free sheet music! (2004) The text for this ethereal (I love that word lately!) Christmas song comes from 3 Nephi, when the Lord lets Nephi know that "This night shall the sign be given." We've always needed a Nephite Christmas carol, so here it is! :) It was written for a performance at the St. George Utah Festival of Trees. I really enjoy Shalece's interpretation this piece, it gets stuck in my head quite often.